You can bake and serve from this dish--it looks lovely on the table. The lack of handles means it fits in my toaster oven, too. This clear glass baking dish holds also works well for this casserole. It has the convenience of a lid which comes in very handy making it ahead and storing in the fridge. I use these affordable shears to cut the bacon and green beans. They get daily use in my kitchen. I used these tongs to toss the bacon pieces and mushrooms as they cooked in the skillet. This is another tool that gets lots of use in my kitchen. In this recipe, I used it to combine the yogurt, cream, and seasonings. There is no canned soup in this recipe. It's made completely from scratch. 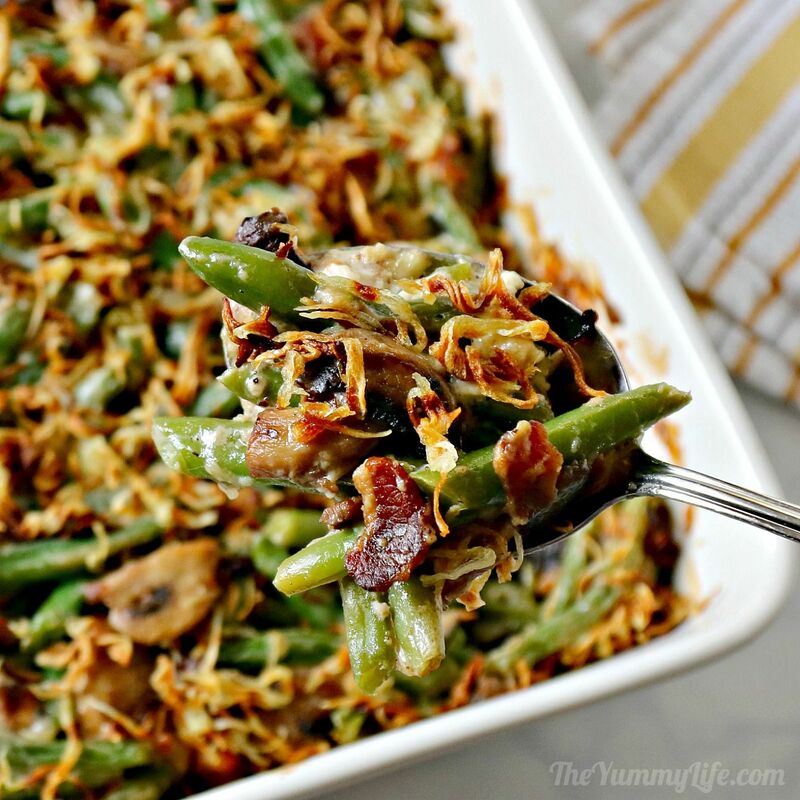 Green beans with bacon, cheese, yogurt, and mushrooms topped with crispy onions results in an amazing flavor and the ultimate comfort food casserole. Preheat oven to 375 degrees. Grease or spray a 9x13 baking dish and set aside. Bring a large pot of water to a boil, add 1 tablespoon salt and green beans. Boil for 5 minutes and immediately transfer to bowl of ice water; cool completely. Drain and spread on kitchen towel to dry. Roll in towel to remove as much water as possible. Add bacon to large skillet and cook on medium high until browned well on both sides. 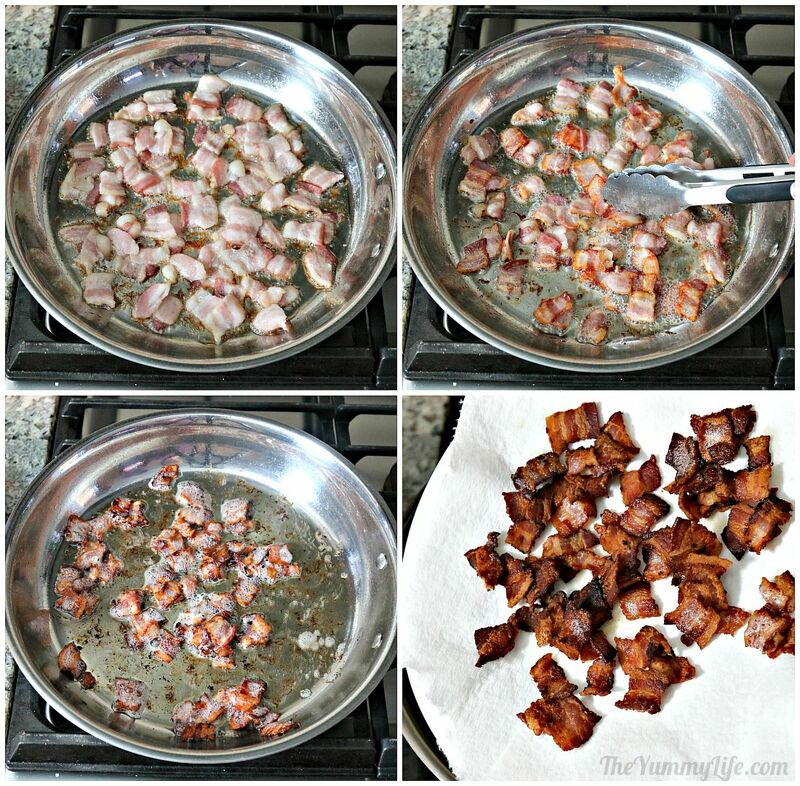 Remove bacon and drain on paper towel; remove all but 1 tablepoon bacon grease from skillet. 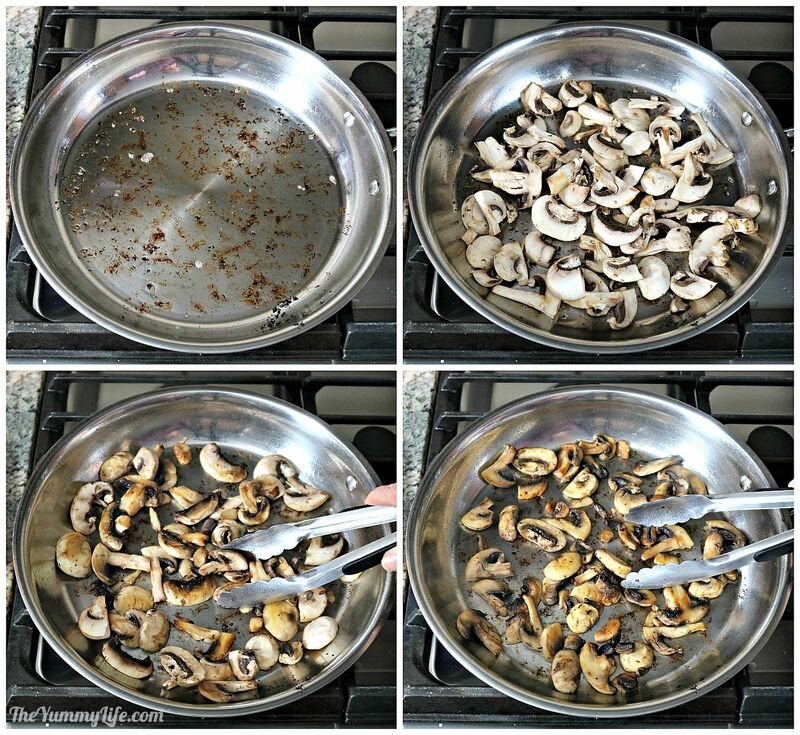 Add mushrooms and cook for 5 minutes until browned, tossing with tongs periodically. In large bowl, whisk together yogurt, cream, thyme, salt and pepper. 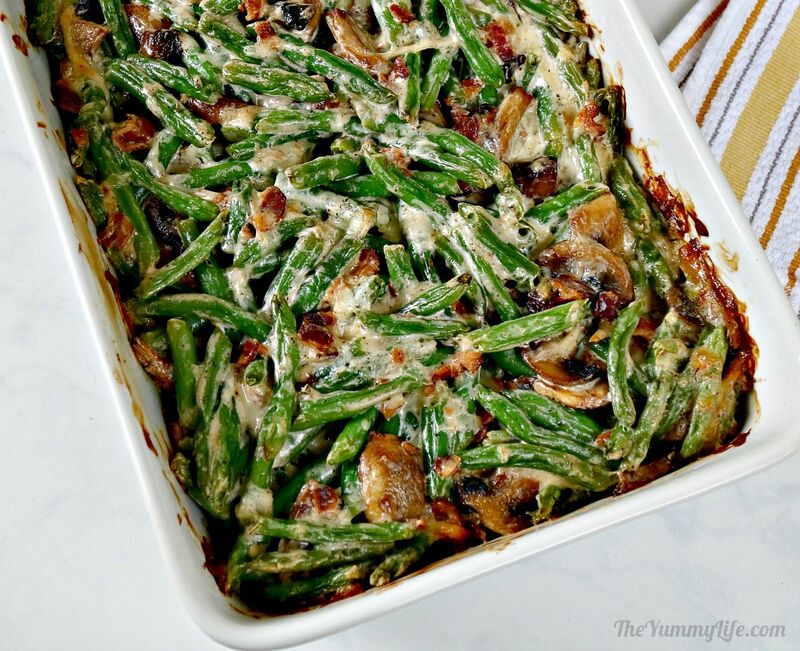 Add green beans, bacon (crumbled in your hand as you add it), mushrooms, and Gruyere; stir until evenly combined. Transfer mixture to prepared baking dish. Bake uncovered for 30 to 40 minutes until hot in center and lightly browned. 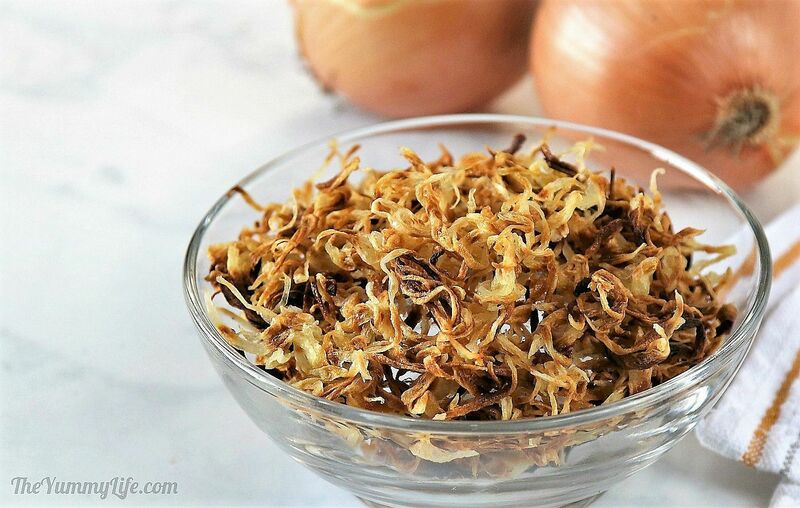 While casserole bakes, make crispy onion strings. Sprinkle evenly over top of baked casserole before serving. --Casserole may be prepped up to 24 hours ahead, covered, and refrigerated. Remove from fridge 30-60 minutes before baking to bring to room temperature and facilitate even cooking. --Crispy onion strings may be made a day head and stored in a sealed container. Adapted from New York Times Green Bean Casserole recipe. 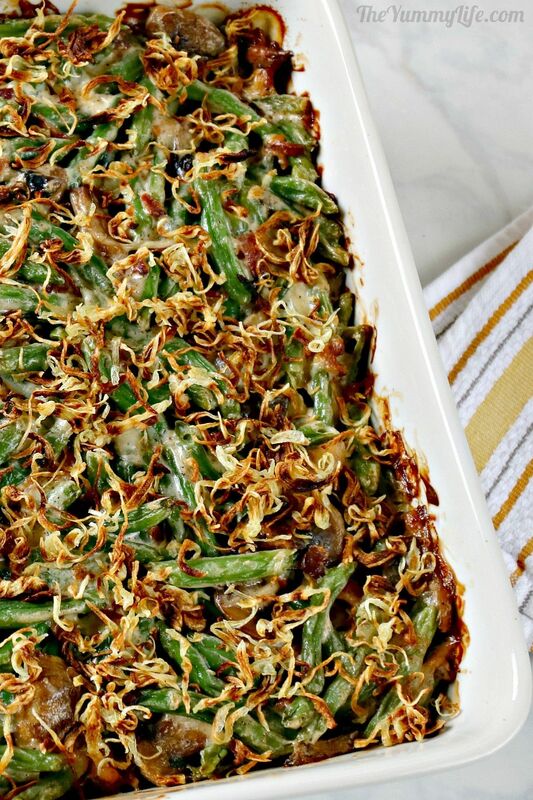 This is not your grandma's green bean casserole. 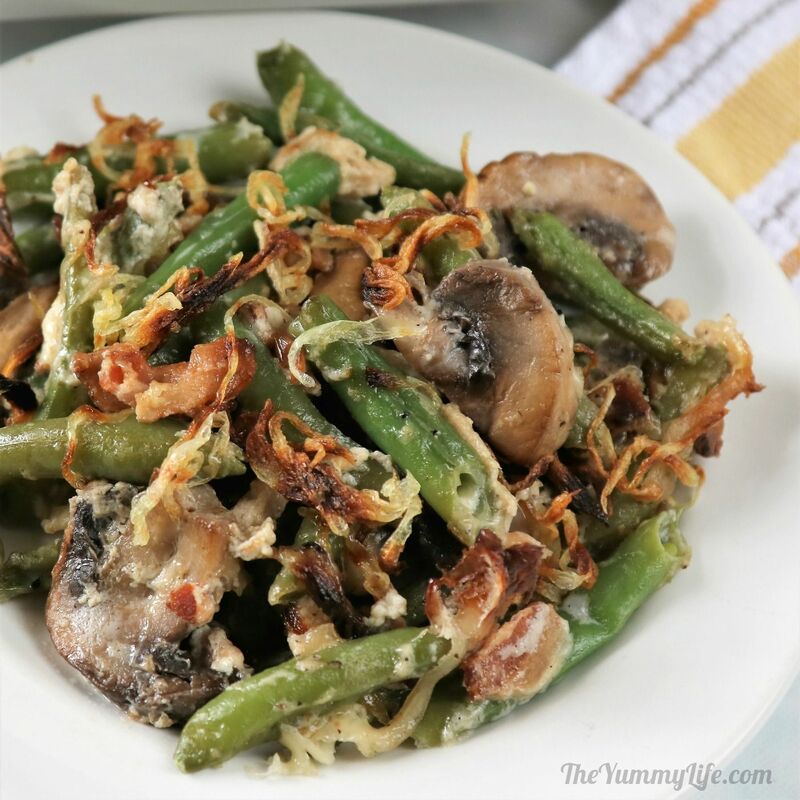 So, if you're looking for the traditional recipe that uses canned cream of mushroom soup, canned green beans, and canned fried onions, this isn't for you. 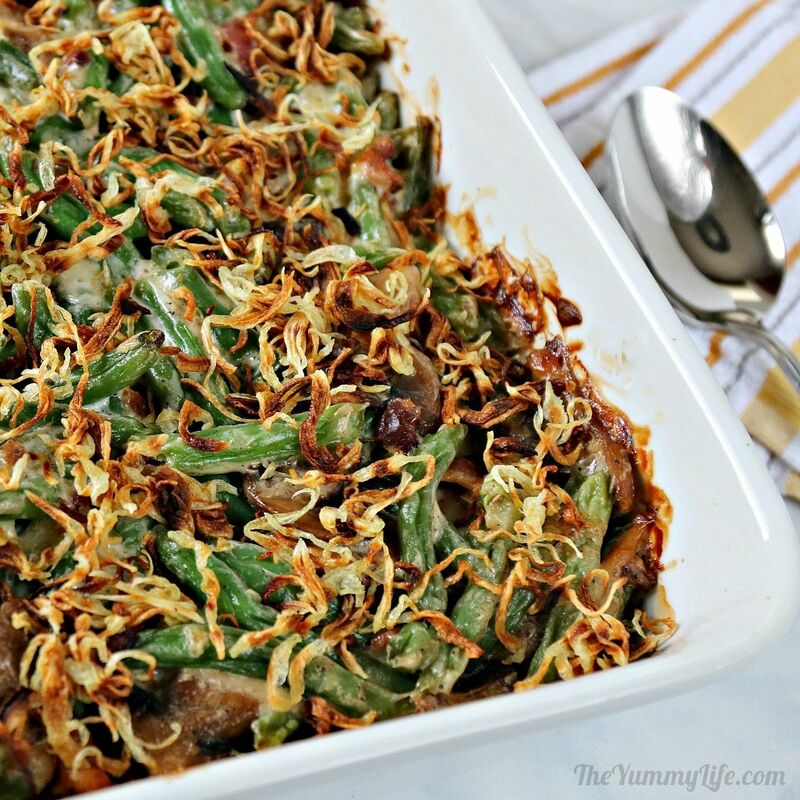 This green bean casserole is made completely from scratch using fresh ingredients. It's cheesy and infused with the scrumptious flavor of bacon, so it definitely fits in the "comfort food" category. It has seriously amazing flavor and is my choice for our Thanksgiving table. So yummy! My recipe is adapted from a NYT green bean casserole recipe. I've changed a few ingredients to lighten it up a bit (although it's still quite rich) and added a crispy onion topping to mine. I'll share how I prep this ahead so there's no last-minute stress in getting it ready to serve on those hectic holiday cooking days. Step 2. Make the crispy onion topping. I explain how in a separate post: Easy Microwave "Fried" Onion Strings. MAKE AHEAD TIP: These onion strings can be made a day ahead and stored in an airtight container at room temperature. Step 3. Remove the leaves from the thyme sprig. Step 4. Cut the bacon into 1" pieces. Step 5. Snip the ends off the green beans and cut them in 2- to 3-inch pieces. 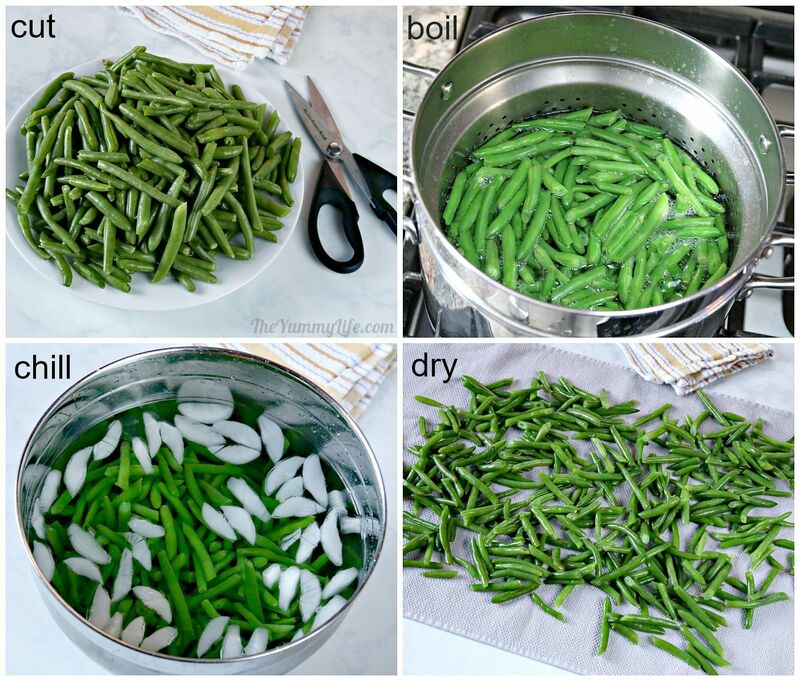 Bring a big pot of salted water to a boil, add the green beans, and cook for 5 minutes. Drain them and submerge in a big bowl of iced water until cool. Drain and spread them on a kitchen towel to dry. Roll them in the towel to remove as much water as possible. Step 6. Cook the bacon in a skillet over medium-high eat until browned and crispy. Remove the bacon and drain on a paper towel. Step 7. Remove all but 1 tablespoon of bacon grease from the skillet and saute the mushrooms, tossing with tongs, until cooked through and browned and no liquid is left in the pan. Step 8. 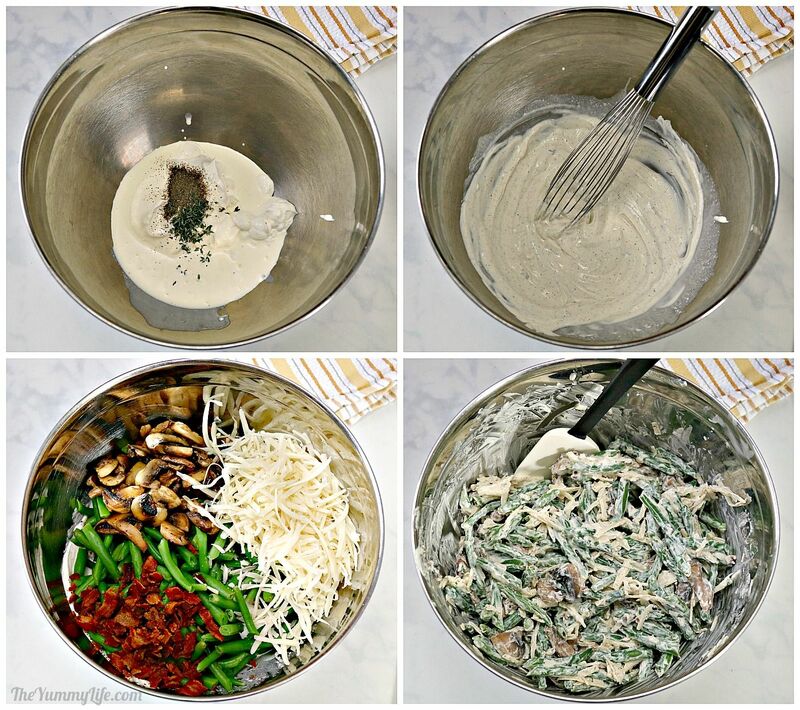 In a large bowl, whisk together the yogurt (or sour cream or creme fraiche), cream, thyme, salt and pepper; then add the Gruyere and cooked green beans, and mushrooms. Crumble the bacon in your hands as you add it to the bowl. Stir to combine into an even mixture. Step 9. Transfer mixture to a greased or sprayed 9x13 baking dish. MAKE AHEAD TIP--Casserole may be prepped to this point up to 24 hours ahead, covered, and refrigerated. Remove from fridge 30-60 minutes before baking to bring to room temperature and facilitate even cooking. Step 10. Bake uncovered until hot throughout and lightly browned, 30 to 40 minutes. Step 11. Sprinkle crispy onion strings on top. Now enjoy! It's such a winning combination of flavors and textures.